What Florence Sites to Book Ahead? Our guests often ask for advice on which sites to reserve in advance to avoid waiting in long lines. We know those lines so well. I remember a special excursion to Florence years ago with my young son, having driven for 2 hours from our countryside vacation rental. He really wanted to see Michelangelo’s Bound Prisoners in the Accademia (even more than the prospect of seeing the original David that is also there). We arrived at the Accademia that hot July day to find a line at least an hour-and-a-half long in full sun. As we wilted, my son’s impatience and frustration grew and we gave up, learning our lesson that for some sites a little advance planning is well worth it. Here are our tips for which Florence sites you absolutely should buy tickets for well in advance, or face the prospect of waiting in line, even during off-season. Before leaving for Italy be sure to print your ticket vouchers and bring them with you. 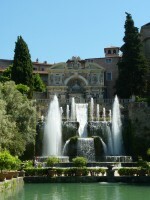 Fantasy and reality combine to create a world beyond our dreams at Villa d’Este in Tivoli, just outside of Rome. Cascading fountains draw you inside, whispering their secrets as you pass and cypress trees stand tall, guarding the estate and its terraced gardens. Looking up to the main house, you wonder if Juliette will come to the window looking for Romeo as a renaissance ball spills into the garden below.